WHEN AAKASH WAS A YOUNG BOY, his family lost their small plot of land in the Indian state of Maharashtra to make way for a government dam-building project. The Indian government is legally required to compensate people it has displaced from their homes, but Aakash’s father, a virtually illiterate low-caste farm laborer, was compelled to sign theirs away without fully understanding what he was doing. The family eventually settled on the outskirts of a village, where Aakash’s father was never able to earn enough money to support the family, let alone pay his son’s school fees of 100 rupees — less than two dollars a year. His mother never went to school. His father left after the fourth grade. Aakash (whose name has been changed out of respect for his privacy) got lucky. The Rashtriya Swayamsevak Sangh (RSS), the nation’s predominant Hindu nationalist organization, took him under its wing and paid his annual school tuition. He, in turn, spent his summers and weekends in RSS camps and training sessions, learning the tenets of the Hindu Right, which include Hindu supremacy and advocacy of a strong caste system. The other young recruits came from similarly poor backgrounds, attracted by a stable source of food and financial support. The RSS thrives in the gap between the needs of the poor, urban and rural, and what limited services the government provides. Its political arm, the Bharatiya Janata Party (BJP), gains support for its political agenda through the RSS’s wide-ranging social programs: schools, health centers, rural development projects, and disaster relief. The RSS also cultivates loyalty through its local branches, like the one with which Aakash was involved. It addresses India’s human needs — physical, educational, and spiritual — providing the kind of comprehensive social and political project that the Congress party, which has largely dominated Indian national politics since independence in 1947, has failed to provide. In the five-week-long 2014 national elections, India’s electorate, 815 million strong, voted overwhelming for Modi, the BJP candidate. It was an impressive feat, successful in part because Modi drew national attention away from his social record and RSS ideology to focus it on economic growth in Gujarat, the western state where he served as chief minister. That he not only survived the political fallout from the 2002 massacre of Muslims in Gujarat — which happened under his watch and some argue was sanctioned by him — but rebuilt his political image so effectively that he became prime minister only 12 years later, is a testament to India’s obsession with its economic promise. 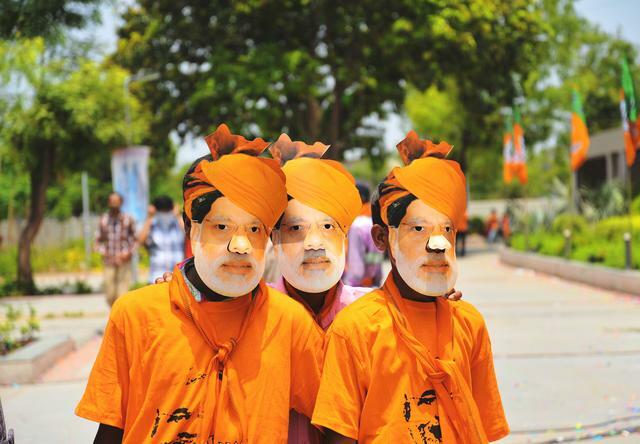 It is not clear, however, that the Hindu Right’s comprehensive project can hold together. Will Modi’s focus on economic growth mean that India’s social problems — caste, poverty, illiteracy, religious violence, sexual violence — again be neglected? 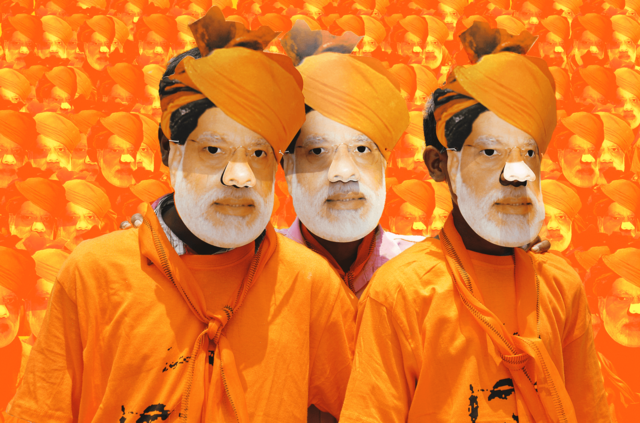 Might economic prosperity provide an opening for more robust campaigns for social reform, or will Modi’s Hindu nationalism resurface at the expense of the lower castes? THE DISPARITY BETWEEN political institutions and social reality is one of the defining features of contemporary India, expressed most starkly in the gap between de jure equality and de facto inequality. “Equality of status and of opportunity” is enshrined in the preamble to the Constitution of India, alongside justice, liberty, and fraternity. One manifestation of this push for equality is a quota system that reserves a given number of political posts for women and members of specific castes and tribes, and has resulted in real political mobilization and power-sharing. Yet in spite of the country’s liberal political foundations and the representation of lower-caste groups in government, Indian society remains rigorously hierarchical and unequal. Many elites — even those who collaborate politically with lower-caste leaders — would never consider their political colleagues social equals, nor allow their children to marry out of caste. And though the lower castes are increasingly conscious of their political rights, societal acceptance of their social inferiority remains widespread. Day laborers and domestic workers, most of whom come from lower castes, are not in a position to protest their exploitation. Lower-caste women face the constant threat of sexual violence. Many poor students grow accustomed to having their teachers not show up at school; others are too poor to attend in the first place. Darker-skinned Indians, more likely to come from lower castes, see in ads for skin-whitening products another reminder that fairer skin is a mark of beauty. So ubiquitous is caste-based discrimination that even the personal ads in the Times of India are organized in descending order by caste, with a small “Caste No Bar” subsection at the end. This troubling divide has its roots both in the development of the modern Indian state and in the nature of Hinduism and Hindu society. Before political independence and self-determination were on anyone’s agenda, Indian thinkers and public figures were already considering what social democratization would look like in a nation so fundamentally shaped by social hierarchy. And the nineteenth and twentieth centuries saw numerous attempts to bring Indian tradition, especially Hinduism, in line with a vision of a modern liberal — and sometimes explicitly egalitarian — society. Bhimrao Ambedkar, the chief architect of the Indian constitution and the nation’s first law minister, anticipated the problems that inequality would pose to the development of independent India as a modern democratic state. Ambedkar’s experience as a Dalit, or “untouchable,” as well as his remarkably rigorous and international education, led him to advocate for social reform, broader access to education, and the abolition of the caste system. And when much of that activism proved unsuccessful, he rejected Hinduism altogether. 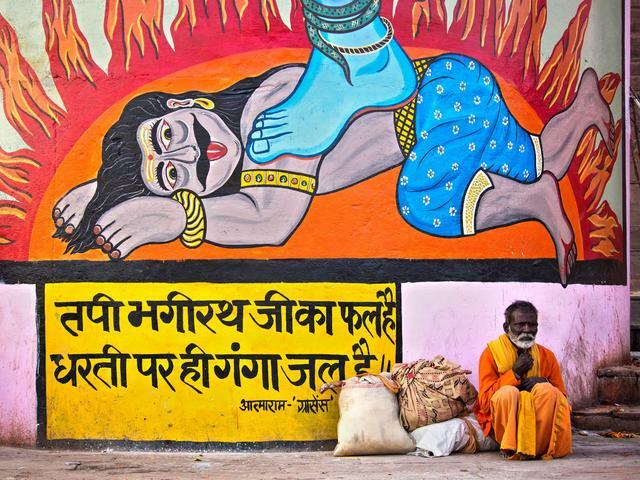 Can Hindu social practices be adapted to a modern democratic society? Or is that an impossible task? LIKE EARLIER MOVEMENTS that sought to break with orthodox Hinduism (most notably Buddhism and Jainism), reform efforts in the nineteenth century emphasized direct, unmediated interaction between individuals and the gods — undermining the power of the Brahmins (the highest, priestly caste). Two major reform movements, the Brahmo Samaj and the Arya Samaj, went further, offering critiques of religious, caste, and gender hierarchy and promoting a vision of a more egalitarian and communal faith. The Brahmo Samaj, founded in 1828, embraced a version of Millian liberalism while seeking to reform Hinduism for modern times. It established a canon of Hindu scripture and denounced many Hindu practices, including the caste system. The Arya Samaj was heavily influenced by the work of the Brahmo Samaj; in 1875, it translated the Vedas, Hinduism’s ancient Sanskrit holy texts, into vernacular languages and pushed for literacy as a way of building an inclusive religious community. The Arya Samaj favored merit-based castes and social welfare as the vehicles of its egalitarian, pluralistic vision, and emphasized the importance of individual religious morality and an attendant social mobility. The Brahmo and Arya Samaj laid a foundation later built upon by Hindu leaders Swami Vivekananda and Mahatma Gandhi. Vivekananda, a much-beloved nineteenth-century Hindu monk and philosopher, saw the potential for divinity in every individual and preached the importance of mass education and material improvement to the development of a vibrant, modern Hindu society. Gandhi sought to shift the focus of Hinduism away from the ideal of spiritual renunciation towards a practical commitment to improving society. Ultimately, the prominence of upper-caste leaders in social reform efforts tempered the movements’ critiques of Hinduism. The more radical movements were led by lower-caste leaders. Most notable among these was the “non-Brahmin” movement in western India during the 1870s and 1880s. Jotirao Govindrao Phule and his Satyashodhak Samaj (“truth-seeking society”) were the most radical incarnation of this movement, with an emphasis on the lower castes as a moral and historical community that transcended conventional religion. Phule’s rejection of the upper castes and their traditionalist Hinduism placed him in opposition to the Brahmin-led Indian National Congress, which was founded in 1885 as a pro-independence political organization and later came to dominate the political scene. Even though the Congress drew on the efforts of nineteenth-century social reformers, it focused its efforts on opposition to British rule rather than on internal reform. This anti-imperial focus also meant that the brand of secularism developed by Jawaharlal Nehru, India’s first prime minister and a member of the Congress party, never adequately addressed India’s deep-seated religious and social contradictions. Ambedkar participated in Nehru’s project, but also drew on those earlier nineteenth-century social reform movements that the Congress had sidelined. Consequently, he saw clearly the contradictions that resulted from the constitution he helped to write. India’s Constitution did not establish an official religion, nor did it not offer any kind of uniform civil code. Untouchability was banned, but caste hierarchy remained largely intact. Discrimination against women and Muslims went unaddressed. The constitution’s framers studiously avoided using the word “secular” (the term was later inserted by amendment in 1976), and in so doing they initiated a brand of secularism in which the state maintains a neutrality toward India’s different religions instead of complete separation from them. Ambedkar believed that this constitutional structure would, in practice, promote Hindu interests in government while perpetuating the caste system in society. In 1948, proposals for a “Hindu Code” sought to establish a civil code in the place of traditional Hindu practice. In the long debate that followed, Ambedkar proposed major reforms, including the abolition of the caste system; the enactment of property inheritance for women; the legalization of divorce; and the inclusion of Sikhs, Jains, and Buddhists under the code’s jurisdiction. His proposals were gutted and the resultant bills were ultimately defeated. For Ambedkar, it was the final outrage. He resigned as India’s law minister in 1951. After that defeat, Ambedkar concluded that even if political equality were achieved for Dalits, they would never be accorded dignity and recognition within a Hindu social sphere. In the last five years of his life, he turned his efforts toward a larger project of social reform. Although he rejected Hinduism, he understood that the Dalits could not cut themselves off from Indian tradition entirely; they needed something to connect them with the project of creating an Indian modernity. In the last months of his life, Ambedkar converted to Buddhism — along with almost 40,000 Dalit followers — out of hope that his social egalitarian reworking of the faith would provide a more stable foundation for Dalit political participation in Indian democracy. ALTHOUGH CASTE AND SOCIAL INEQUALITY persist in modern India, the poor are now political in a way unheard of in the first several decades after independence. At independence, India had a small, highly educated urban population, which dominated the political sphere and was quite separate from the largely rural, staunchly traditionalist majority. 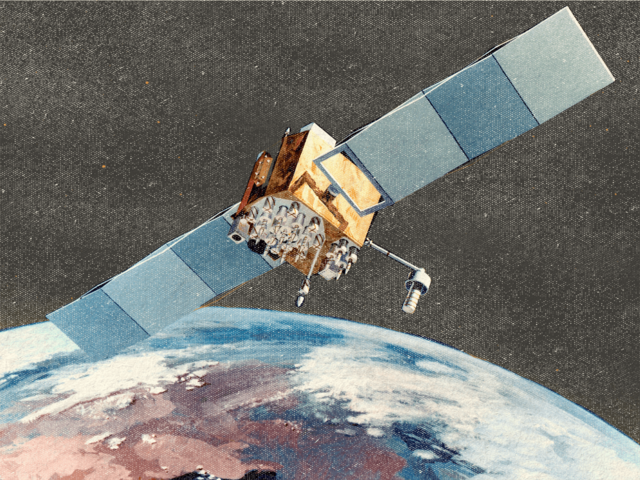 But with the expansion of the Indian state in the 1980s and the dismantling of the planned economy in the early 1990s, that dynamic began to change. Until the 1980s, Indian democracy was marked by the simultaneous existence of modern and traditional sectors. Different elites — industrial capitalists, rural landowners, urban managerial classes — grappled for political power. As the urban middle classes grew in power and began to focus their energies on the business sector at the expense of political involvement, the government extended its services into the impoverished countryside. The new Indian elite — urban, commercial, single-mindedly dedicated to business — left a vacuum in government, and by the 1980s the rural poor increasingly found themselves engaged in politics through the struggle for adequate government services. The 1980s also saw the decline of Jawaharlal Nehru’s secular nationalist vision for the country and, as a consequence, the rise of caste-based politics. In 1980, the Indian Parliament’s Mandal Commission issued a report recommending quotas in public education and state employment, reserving 27 percent of openings for members of lower castes (also referred to as “other backward classes” or “OBCs”). The commission’s recommendations were not implemented until 1990, and even then, the introduction of quotas drew heated public debate and violent demonstrations. The increasing political mobilization of the lower castes threatened the dominance of traditional elites. To appease the elites, the government began to rearticulate the question of equality in terms that promoted merit as a political principle, precluding any real consideration of social condition and caste. In spite of India’s liberal political foundations and the representation of lower-caste groups in government, Indian society remains rigorously hierarchical and unequal. The debate surrounding caste quotas has been further complicated by the question of quotas for women. Along with the development of caste politics, the 1980s saw the emergence of nonpartisan women’s rights groups, which have sought to bring public attention to issues such as marriage dowries and sexual violence. In 1993, two constitutional amendments established a 33 percent minimum quota for women in village and district councils. And in 1996, the Women’s Reservation Bill (WRB) was introduced to extend that quota to the lower house of the Indian Parliament and all state legislative assemblies. Nineteen years later, the bill is still pending. Critically, the most powerful opposition to the WRB has come from OBC and Dalit parties, which fear that quotas for women would limit the lower castes’ newfound political power. For many, caste identification is stronger than gender identification, and the women’s movement has long been criticized for being overly focused on the concerns of upper-caste women and insufficiently sensitive to the problem of caste. Some critics assert that in basing political representation on caste, India has made caste identity inescapable. Upward social movement does not change caste identity; an individual who improves his or her economic status is still marked by his or her caste. Although quotas have opened up the possibility of political representation — and even higher education — for some lower-caste individuals, they have not brought about increased equality in the social sphere. 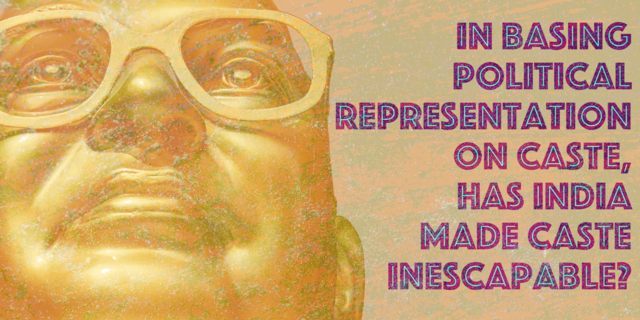 Caste persists in the social realm in part because caste identity is the path to political recognition and power. And as long as caste identity is the key to political recognition, the pernicious social aspects of caste will continue to define Indian society. 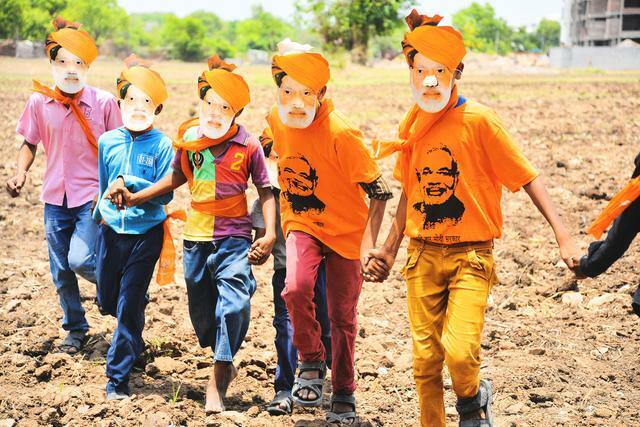 Boys play in a field in front of a BJP office in Gujarat while wearing masks of Narendra Modi; May 16, 2014. Abigail Fradkin studied political philosophy at Harvard College, and studied and taught in India. She currently works with immigrants and refugees in New York at the nonprofit organization Upwardly Global.